You know that feeling when you finally have decided that you will splurge on a great dessert and then it isn’t so great. After suffering some trauma about this, I’m here to solve that problem for my readers. I’m still smarting about a disappointing encounter with a coconut cake that was not all it seemed almost 20 years ago. Shortly after I moved to Los Angeles to join my honey, Mr. Dot, I found myself in Santa Monica’s shopaholic-paradise Montana Ave. where I was doing some pre-wedding shopping. It’s kind of mind boggling that I was considering any dessert treat because it was pretty clear that none of the boutiques on Montana Ave. carried the insanely large (by LA standards) dress size that I wore at the time—American size 8. At that time (1998), the sizes you could buy on Montana Ave were 0, 2, 4 and maybe 6 (which sometimes worked on me). They hadn’t invented the 00 yet but there were some good tailors if you needed them to take in your clothes. For the record, the average American woman wears a size 14. She probably loves coconut cake. In any event, that Santa Monica coconut layer cake looked so delicious back in 1998. It had two tall layers and lots of frosting and some very seductive large coconut curls. I went ahead and ordered a slice. And then I found out how all those women in LA stay so slim. Actually this beautiful looking cake was a metaphor for LA. Joan Didion or maybe James Ellroy should have written about this cake. It wasn’t a coconut cake. It was a vanilla cake with some beautiful looking coconut swirls outside and inside, bland, bland, bland. It was a foul lie. Hmmm. Maybe the movie Chinatown is the best way to describe this cake—the whole thing was based on a big lie. This was not the kind of cake that Ms. Dot Jr. (also known as my fearless photographer) was going to make for her best friends’ birthday (the apostrophe is in the right place—the best friends are twins). Every year, Ms. Dot Jr. bakes a cake for their Christmas birthday and she decided on coconut this year. Chez Dot, when we say coconut cake, we mean coconut IN the cake and coconut IN the frosting. And it was so great, Ms. Dot Jr. ended up creating coconut cupcakes, too. 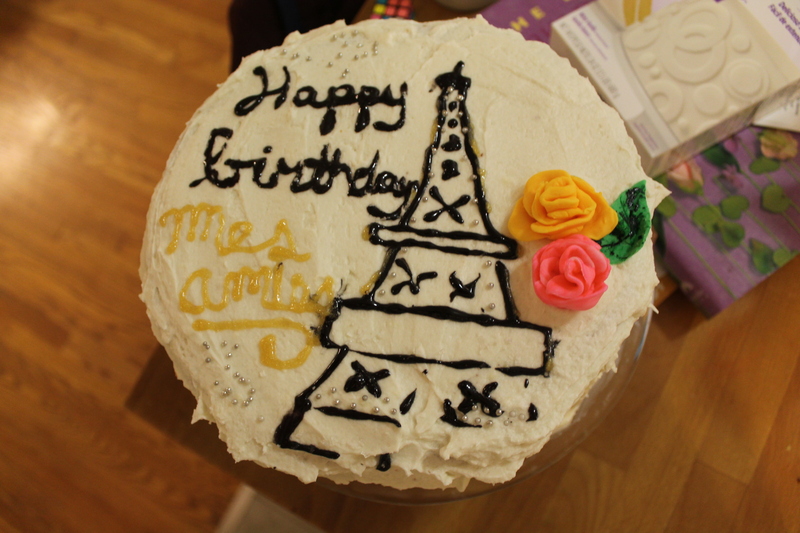 Baked, conceptualized, decorated and photographed in honor of the anniversaries of les amies of the fearless photographer on the eve of their trip to le France. Line a cupcake tin with cupcake liners or if your more free form and adventurous, with parchment paper. Beat the butter, sugar and coconut essence until light and fluffy. Add the eggs, one at a time, beating well after each addition. Fold in the coconut and flour alternately with the buttermilk. Spoon the mixture into the cupcake tin and smooth the surface. Do not fill too high because you want cupcakes and not muffins (unless you don’t plan on frosting these and you do want muffins!). Bake for 35 minutes—testing for done-ness. These should be golden on the top and a skewer should come out clean. Leave in the pan for 5 minutes and then turn on a wire rack to cool. When cool, they are ready to frost. Reduce coconut milk by boiling it in a large deep saucepan over medium-high heat (it will boil up high in the pan). Reduce heat to medium-low. Boil until reduced by half, around 25 – 30 minutes. Remove from heat and let cool. This can be done up to 2 days ahead. Using electric mixer, beat butter until smooth. Add sugar, ½ cup reduced coconut milk, vanilla and salt. Continue to beat on medium low until blended, scraping sides and then add coconut and beat further until light and fluffy. 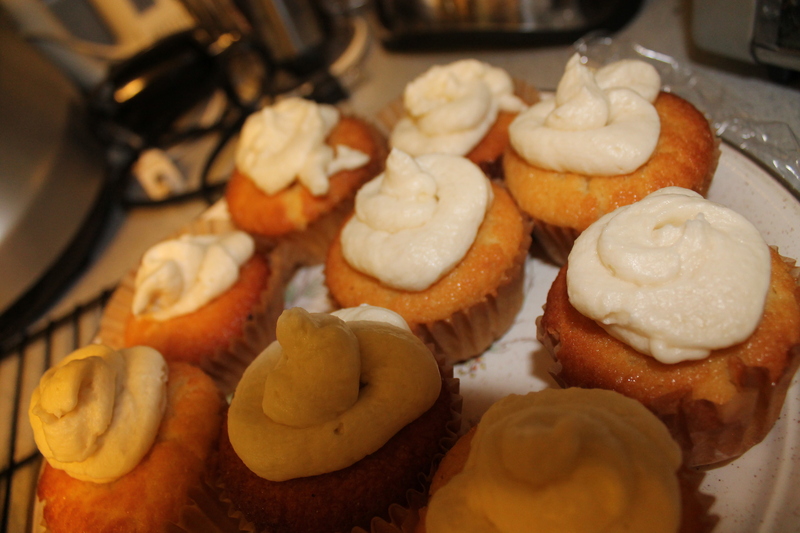 Using pastry bag or offset spatula, frost the cupcakes. For a simple and quick way to frost (as we did) you can use a small baggie and snip off the corner. Not the fanciest, but they look nice. To be honest, before we served them, I wasn’t sure if every one loved coconut as much as we do—but then when people had seconds and thirds, I realized that people do love coconut and it’s worth the splurge.